In 2013, printmakers from around the world were invited to make prints for the Al-Mutanabbi Street Project. Each artist was asked to reflect and respond to the bombing of the bookseller’s quarter in Baghdad in 2007 and to be part of a global coalition of artists, poets and writers that states that wherever people talk freely and creativity breathes, Al Mutanabbi Street starts. During a gathering on March 5, 2015 in memory of the car bombing of Al-Mutanabbi Street I met Dr. Fawzi Abldulrazak, an Iraqi leading scholar who now lives in the US and owns a private Arabic book shop. During the evening we shared a meal and readings about Al-Mutanabbi Street and were visually introduced to the project, Absence and Presence. “ -I was born in Kirkuk and moved to Baghdad to study Islamic Law. I rented a room with window view on Al-Mutanabbi Street. Through the window the rumors of the street were coming to me. I discovered the street with all of its bookshops, coffee shops, and small restaurants. Every Friday after the prayer, the booksellers would display bargain books on the streets. Books lovers, philosophers, poets, and intellectuals would gather on the street and browse through the books, drink tea and exchange ideas. You could find everything you wanted on Al-Mutanabbi Street. I bought many books and discovered many foreign writers, poets, philosophers including Jean-Paul Sartre, and Simone de Beauvoir. All the books were translated into Arabic language. On this street, I met many intellectuals who I admired, and over of a cup of tea we would discuss philosophy, literature and poetry. Little by little my path changed. I became more and more interested in philosophy. I am now who I am because of Al Mutanabbi Street. Books are the seeds of knowledge. Even buried deep under rubbles and ashes, like a seed buried deep under the snow, knowledge does not perish. It survives. It continues to grow and grow even stronger. Bombs cannot erase knowledge and culture. Knowledge can never be destroyed. I want my print to demonstrate this strength. 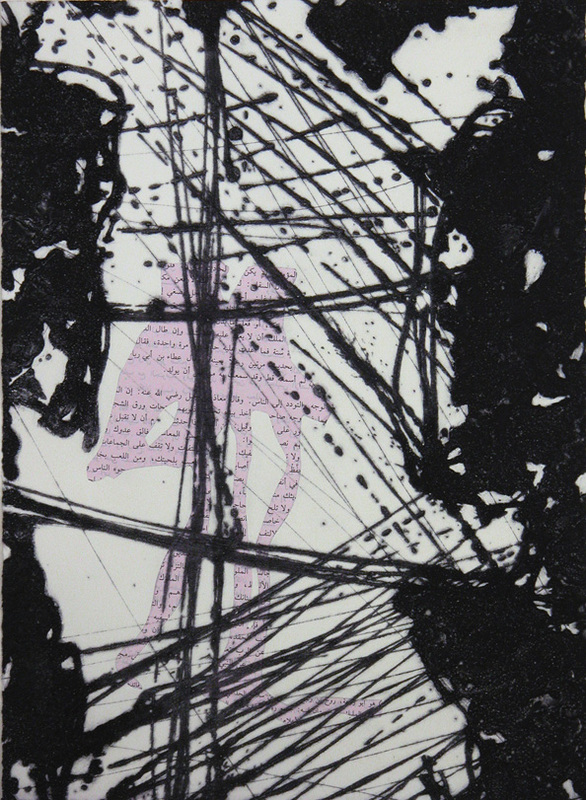 I want my print to show the power of books.In the background, the soft pink silhouette cut out from an Arabic book page symbolizes Fawzi, the globetrotter and all the Iraqis who came and still are coming to Al-Mutanabbi Street in search of culture. The silhouette represents these scholars walking into the busy Al-Mutanabbi Street on a Friday after the prayer, completely soaked of the indelible knowledge that emanates from the street. The dark black lines illustrate the chaos of the bombing in the small street. Despite the attack and confusion the globetrotter is still there, hurt but standing. His knowledge is not erased, not damaged. His knowledge will survive and continue to grow!